Three methods of installation for the engineered flooring. This is only a guideline for reference. Follow the National Wood Flooring Association’s installation guidelines and recommendations when installing FERMA branded products. It is recommended that three methods of installation for the engineered flooring: staple down, fully spread glue down and float (only applied to 4 ¾” or 5” or wider planks). The two basic acceptable sub-floors are wood (plywood, OSB) and concrete. These will be addressed separately. It is also recommended that installation should be made by experienced professionals who subscribe to installation standards as set forth by NOFMA, NWFA. It is not recommended installing engineered flooring over particle board, MDF, wafer board, masonite or luan underlayment or and radiant heat system. The installation of engineered flooring must be conducted after kitchen cabinet or counter is installed. No flooring should be installed underneath any kitchen cabinet or counter. Otherwise, it will be treated as improper installation. Engineered flooring is machined to exacting tolerances. Its use is limited to on-grade or above grade applications. Full bath installations are not recommended because of moisture issues encountered there. Use of approved products during installation as described in this installation instruction is required to validate all warranty. Sawing, sanding or machining of wood flooring can cause respiratory, eye and skin irritation. The International Agency for Research on Cancer has classified wood dust as a nasal carcinogenic in humans. If using power tools, a dust collector is recommended, as is a dust mask NIOSH approved. Avoid contact with the eyes or skin when in proximity to wood dust. Use of a protective device for the eyes is also recommended. The purchaser/installer should inspect all of the floorings before installation. Being a natural product, hardwood rarely will be perfect. Industry standards of manufacture allow for grading deficiencies up to 5%. This 5% may be composed of natural or manufacturing deficiencies. The purchaser/installer should carefully examine the flooring for color quality and finish. 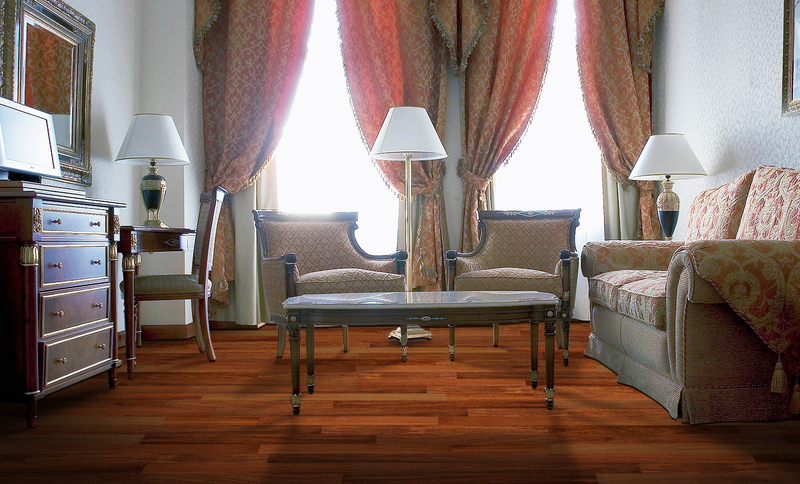 Wood flooring is a product of nature characterized by distinctive variations in grain, pattern, and color. These natural variations are neither flaws or defects, but rather the natural beauty and uniqueness of wood, and should be expected. If there is any product discrepancy or not acceptable, DO NOT INSTALL it. The seller should be contacted immediately. Installation of flooring denotes installer and owner accept the materials, even if the owner is absent at the time of installation. The manufacturer shall not be responsible for costs associated with repairing or replacing flooring installed with visible defects. It is also required that all orders for pre-finished flooring include an additional coverage of floorboards – minimum five percent of the actual footage – to allow for proper cutting and installation. It is noted that stain-putty filler is an accepted part of the installation procedure throughout the industry. It is the purchaser/installer’s responsibility to determine the suitability of the job site environment and sub-surfaces involved. Installation must follow recommendations of the construction industry and the material’s manufacturer as well as local codes. Reference is made to NWFA requirement for minimum job site conditions and substrate requirements. FERMA declines any responsibility for job failure or non-acceptability from or associated with sub-floor/substrates or job site environmental deficiencies. Unlike unfinished flooring, extra caution is needed during installation of pre-finished wood flooring to prevent scratch and damage. Engineered wood flooring must be installed on grade or above grade. Below grade installation is not recommended for FERMA engineered wood flooring. The building, where the installation takes place should be completed to an environmental control level, whereas doors and windows are in place and paint and masonry work is dry. Basements and crawl spaces must be dry and well ventilated. Crawl spaces must be a minimum of 24” from the ground to bottom of joists. A ground cover of 6-8mil poly should cover the soil in the crawlspace 100%. Seams lapped at least 12” and sealed. Edges should be lapped up the perimeter walls 3”-6” to divert moisture to the outside. This vapor barrier is REQUIRED. Perimeter venting is necessary to provide for cross ventilation. Minimum combined venting should be equal to at least 1.5% square feet of the crawl space or exceed where applicable. Local codes prevail. No dead walls allowed the impeding cross flow of air movement. The installation site should have at or near environmental living conditions 68F-72F temperature, 35%-55% relative humidity, prior to, during installation and or until the site is occupied. These conditions will allow for acclimation of wood to the proper environmental conditions. Moisture testing is still necessary. Exterior grading must drop at least 3” in 10 feet or according to local codes. All gutters and downspouts must be in place and divert run-off away from the structure. Flooring must be stored in a clear dry environment. Do not deliver materials to a site that is not environmentally controlled. This means building must be closed in, windows and doors on, all wet work complete, heat air or equivalent environmental controls functioning, temporarily or permanently. Moisture control is necessary for at least 10 days prior to delivery. The wood sub-floor must NOT exceed 12% moisture content. The difference in moisture content between the sub-floor and wood flooring must NOT exceed 2%. A reliable moisture meter should be used to measure and determine accurate moisture contents. Wood floors installed on excessively moist ground without proper moisture barrier treatments are not covered under the warranty. It is important to ensure that the moisture content differential between your wooden subfloor and the FERMA flooring does not exceed two percent. If the difference is higher than 2 percent, a moisture retarder is required. In addition, prior to installation, the installer should make certain that sub-floors are properly inspected for moisture conditions according to the NWFA guidelines (visit www.nwfa.org for more information). Acclimation is to allow wood flooring to acclimate to sub-floor, with no more than 2% difference in moisture contents. Acclimation time for engineered wood flooring is determined by the moisture content of the sub-floor and the wood at time of delivery, but at least 5-7 days acclimation is needed prior to installation. Note: Not properly acclimating wood flooring may cause excessive expansion, shrinkage, dimensional distortion or structural damage, all of which is not a manufacturing defect, and not covered by this warranty. The worst‐case scenario is one in which wood flooring is stored at the job site in an uncontrolled environment, then immediately installed. This is especially true when the materials are stored in an area that is subject to excessive moisture and humidity conditions. The wood sub-floor must NOT exceed 12% moisture content. The difference in moisture content between the sub-floor and wood flooring must NOT exceed 4%, preferably 2% for exotic and larger plank. A reliable moisture meter should be used to measure and determine accurate moisture contents. Acclimation time for engineered wood flooring is determined by the moisture content of the sub-floor and the wood at the time of delivery, but at least 5-7 days acclimation is needed prior to installation. It is to allow the wood flooring to acclimate to sub-floor with no more than 4% difference in moisture contents (2% is preferred). Provide air flow under and around cartons. Remove any plastic that may be in or on the boxes. Open up the ends of the boxes, to help prepare the flooring for acclimation. To prevent board warping, twisting or bowing do not cut the plastic support packaged bindings or remove the product from the packaging until ready to install. Exotic woods such as Brazilian Cherry (JATOBA) or other species may need longer acclimation period. Remove any molding, base, thresholds and reinstall after the floor has been installed. If covering the floor is needed after installation, it is recommended to cover the floor completely to avoid color changing, since some species are light-sensitive. All covering material should be taped to each other’s overlapping layers and should not be taped directly to finished flooring. Do not cover flooring for a prolonged period, such as weeks, of months. This may damage the flooring by not allowing the flooring to absorb or dissipate moisture content. The flooring must be allowed to breath. Do not use thick sheets of material as covering. Use a covering material with a (perm rating) of 1 perm or more (tested I accordance with ASTM E-96) to avoid trapping moisture/vapor on or within the floor. Distribute Board lengths, avoiding “H” patterns and other discernible patterns in adjacent runs. Stagger end joints of boards, row to row a minimum of 6” for strip flooring, 8-10” for 3” to 5” planks, and 10” for plank wider than 5”. Expansion space around the perimeter for glue down installations is required, which is ½”. Joist spacing 24” o.c. 7/8” plywood. Exterior grade rated panels preferred. The exposure I for OSB rated panels is acceptable. For plywood, CDX APA rated is minimum acceptable. Use of minimum standards will result in the minimum performance of flooring. Do not install solid wood flooring over particle board, wafer board pressed wood or fiberboard. These products do not have adequate nail holding capacity. Installation over inadequate sub-floor will result in poor performance and will void any warranties. sub floors must meet industry standards for flatness. Standards are 1/8” in 6′ or 3/16” in 10′. Sub-floor should be flat within 1/8” in 6 feet or 3/16” in 10 feet. Wood sub-floors must be clean, free of paint, sealers, adhesives, wax or any other debris. If installing over existing hardwood floor, a layer of 5/8 plywood or OSB is recommended before proceeding. Plywood sub-floor should meet APA-PS2-92 standards. Plywood should be tongue and groove. Plywood must be minimum 3/4” CDX. Oriented strand board, OSB, when used must be tongue and groove, installed sealed side down, minimum thickness 23/32”, must conform to US VOL product std PS2-92. OSB must be tongue and groove, exposure 1, preferably exterior grade. It must meet US VOL STD PSI-95 performance STD for 16” on center joist system. Particle board or wafer board are not acceptable as a sub-floor. Engineered flooring is manufactured at 6-9% moisture content. The tolerance between new engineered flooring and sub floor should not exceed 4% point’s maximum, preferably 2% points. All wet work should be completed before delivery of flooring. This includes but is not limited to, ceramic, masonry, painting, drywall work, patching, plaster work… Moisture content should not exceed 12% in the sub-floor. Check floor substrate for deflection. The formula in general is L/360. L is the length of the unsupported span in inches. For example, a 10 feet span, L is 120 (10 feet x 12 inches per foot,) so 120/360 is 1/3. The maximum deflection of this 10 feet span is 1/3″. Nail or secure any loose areas. Any excess vertical movement must be corrected as this will affect long term performance. As manufacturer of specialty flooring, it is not able to evaluate each and every residence’s engineered structural system. Spacing span lengths, sub-floor thicknesses as well as their engineering methods are the responsibility of the builder, engineer, architect or consumer, who are better positioned to evaluate the expected end result based on the site related conditions. When staple method is used, a layer of 15lb. roofing felt is required between sub-floor and engineered flooring. Fastener should be used 4”-6” apart or more as needed to secure product. Fasten each end 1-3” from end. Gluing ends of tongue and groove to minimize shrinkage. Be sure to experiment on a scrap piece first and adjust the compressor setting to avoid damaging the tongue. The recommended adhesive is FERMA DT-7300, with a recommended trowel size of 3/16″ x 3/16″ x 3/16″ Square notch, or DriTac equivalents. If using equivalent use the Adhesive Manufacturers specified trowel size for floor type being installed. Always check for proper bond. Glued down flooring must have a minimum 90% coverage preferably 100%. Pull up occasional boards and observe whether proper coverage is followed. H Joints should be avoided. Ends should be staggered with at least 6” from preceding joint. Avoid a conspicuous stair step pattern. This helps to promote a pleasing overall appearance. Franklin TiteBond tongue and groove flooring glue #2104, or equivalents applied to end joints helps prevent longitudinal shrinkage. If using 3M blue tape to hold pieces in place, it must be removed within 24 hours. If left on longer it may affect the finish. Engineered flooring could be glued down over on concrete. Concrete must be clean, free of wax, adhesives, anti-freeze chemicals, paint, patching compound, curing compounds or sealers, admixtures that are hygroscopic. If in doubt, do not install. Concrete testing on slab 30 days old is the minimum time frame allowable. Less than 30 days old is not a reliable indicator. Concrete must be a minimum of 60 days old before flooring can be installed. It may be necessary to test for moisture multiple times or until acceptable. Some self-leveling cement compound used to correct concrete floor may have shorter curing time. Always check with the manufacture of the self-leveling cement before proceeding with the installation. Concrete sub-floor must be flat to 1/8” in 6ft or 3/16” in 10 ft. Concrete may have to be shot blasted, sacrificed, or ground down until acceptable. Moisture testing is necessary by concrete moisture meter or calcium chloride test. Moisture meters are used to qualify moisture content of engineered flooring, sub-floor, and concrete slab. Installer has the choice of many manufacturers of professional meters. Reading is not to exceed 4.5 on the meter scale. The use of calcium chloride test is also acceptable. Moisture emissions are not to exceed 3lbs per 1000sf. in a 24 hour time period. PH testing is also recommended. A Ph factor of 5-9 is acceptable. 7 is neutral, above 9 requires corrective action. A high Ph factor may affect adhesive stability. Concrete must be at least 30 days old before moisture content testing takes placing. Acoustic concrete and light weight concrete Installer must check with the concrete manufacturer for product compatibilities and any special needs to be addressed concerning installation/performance. FERMA does not accept responsibility for any problems resulting from failure to follow concrete/gypsum manufacturer’s recommendations. The recommended adhesive is FERMA DT-7300, or DriTac equivalents, with a recommended trowel size of 3/16″ x 3/16″ x 3/16″ Square notch. If using equivalent, use the Adhesive Manufacturers specified trowel size for floor type being installed. Always check for the proper bond. Glued down flooring must have a minimum 90% coverage preferably 100%. Pull up occasional boards and observe whether proper coverage is followed. Engineered flooring could be installed with floating (T/G or Click) method, but it is only applied to 4 ¾”, 5” or wider planks. Some self-leveling cement compound used to correct concrete floor may have shorter curing time. Always check with the manufacturer of the self-leveling cement before proceeding with the installation. Concrete sub floor must be flat to 1/8” in 6ft or 3/16” in 10 ft. Concrete may have to be shot blasted, sacrificed, or ground down until acceptable. Moisture meters are used to qualify moisture content of bamboo flooring, sub-floor, and concrete slab. Installer has the choice of many manufacturers of professional meters. Reading is not to exceed 4.5 on the meter scale. The use of calcium chloride test is also acceptable. Moisture emissions are not to exceed 3lbs per 1000sf. in a 24 hour time period. Acoustic concrete and light weight concrete Installer must check with concrete manufacturer for product compatibilities and any special needs to be addressed concerning installation/performance. FERMA ddoes not accept responsibility for any problems resulting from failure to follow concrete/gypsum manufacturer’s recommendations. The recommended adhesive is FERMA DT-7300, or DriTac equivalents, with a recommended trowel size of 3/16″ x 3/16″ x 3/16″ square notch. If using equivalent, use the Adhesive Manufacturers specified trowel size for floor type being installed. Always check for a proper bond. Glued down flooring must have a minimum 90% coverage preferably 100%. Pull up occasional boards and observe whether proper coverage is followed. Underlayment with polyethylene film sheeting generally serves for protecting engineered flooring from moisture damage, adds acoustical dampening and stability. If using floating method over concrete, it should be placed on all concrete sub-floors prior to the installation. Roll the underlayment out over the concrete sub-floor, overlap the edges and use duct tape to keep in place and ensure a waterproof seal. Overlapping will prevent any moisture from seeping through the edges. Also be sure to place the underlayment all the way to the wall and slightly up the wall to ensure a good seal. Do not use masking tape instead of duct tape as it makes a noise when walked on and is not waterproof. T/G method is a floating installation by gluing tongue and groove. With using this method, floating is attached to the flooring itself and not to the sub-floor. It is installed over various types of cushion underlayment. This method is suitable with any sub-floor , but only 4 ¾” or 5” or wider products should be considered for floating. This method involves gluing the tongue and groove joints of engineered flooring together over an underlay. The recommended adhesive is Franklin TiteBond tongue and groove flooring glue #2104, or equivalents. Click method is floating installation by locking system. With using this method, floating is attached to the clicked flooring itself and not to the sub-floor . It is installed over various types of cushion underlayment. This method is suitable with any sub-floor, but only 4 ¾” or 5” or wider products should be considered for floating. In general, click engineered flooring is designed and produced for DIY and saving the cost than the installation of nail-down or glue-down, or even T/G floating. Start in a corner of the room with the locking strip (lower edge of the lock) facing into the room. Using spacer wedges, maintain a ½” gap between the wall and the edges of the planks being installed. Install the first plank. Install the second plank, pressing the short end of the second plank against the leading edge of the first plank and then, in one movement, laying it down flat to engage the locking mechanism. Ensure that the edges of all planks being installed are parallel and even. Continue with this method until you are ready to install the last plank of the first row. Carefully measures the required length of the last plank in the row, allowing for a minimum of a ½” gap at the end of the row. Cut the last plank of the first row to size using a saw with a carbide blade, then install as done for the previous planks, leaving ½” gap at the end. After the first row is complete, ensure that all edges are perfectly even and parallel. Note: It is practical to fine-tune the gap between the long sides and the wall later, after the first three rows have been laid. Start the second row beginning with (if available) the piece left over (cut off) from the first row – piece must be at least 30cm (11.8”) in length. If the piece is too short (or if there is no leftover piece), start with a new board, cut in half. Always ensure that the end joints (between planks in adjacent rows) are staggered at least 25cm (9.84”) apart. Maintaining a ½” gap between the end of the plank (row 2 plank 1) and the wall using a ½” space, begin the second row by inserting the long edge of the locking mechanism of the first plank (row 2 plank 1) into the long edge of the locking mechanism of the adjacent plank of the first row. Push the plank forward and press down at the same time to fully engage the locking mechanism. With the plank resting flat on the floor, ensure there is no gapping at the joint between it and a first row. If necessary, use a tapping block to ensure that the plank’s locking mechanism is fully engaged and that there is no gap between it and the adjacent plank. To install the second plank (row 2 plank 2), place the long edge of the plank into the adjacent plank of the first row. Slide this plank to the left until the short end of the second plank is flush against the leading edge of the first plank (row 2 plank 1). Then, in one movement, lay the plank down flat, ensuring that there is no gapping on either the short end or the long side of the. Use a rubber mallet and tapping block to correct any gapping. Note: If gapping cannot be corrected by a rubber mallet and tapping block, ensure that there are no splinters or other obstructions keeping the locking mechanism from fully engaging. Finish installations with following choices of moldings that will enhance the appearance of any installation. Refer to the illustrations and descriptions below for the proper use of each molding. Only for engineered oak models: 7309-N.9309- B, 7409-EG, and 7409-CD.